By providing vessel-to-vessel and vessel-to-shore communication independent of satellite or cellular networks, the Maritime Broadband Radio (MBR) system from Kongsberg introduces possibilities to transform survey operations. Potential applications include delivery of raw data to shore and providing a communication and remote-control channel for multiple survey launches and unmanned surface vessels in a single operation. MBR is designed to connect operational assets and teams by delivering high-performance and barrier-free communications, without the need for expensive infrastructure. This enables the system to unlock a new age of collaboration for complex operational tasks. A MBR network can securely carry a diverse array of information, from real-time video to survey data, and remotely situated teams can work together seamlessly, coordinating systems and activities for optimal performance, safety and operational success. As a high bandwidth, dynamic communication system with the capability to deliver a data link exceeding line of sight, the system unites people, allowing them to work side by side, even when separated by long distances. Objectives, expertise and real-time insights can be seamlessly shared, supporting awareness and understanding and therefore operational efficiencies. Unlike satellite, WiFi or mobile network platforms, MBR requires no specialised infrastructure. There are no subscriptions, no rental agreements and no complicated and costly data charges – just predictable pricing and reliable, high-quality performance, with no moving parts and no need for regular maintenance. This makes it a simple to use, and an easy to install and maintain solution for enhancing efficiency in many maritime operations, including bathymetric surveying. With a suite of different MBR product types available, where each one provides seamless, high-capacity data exchange and reliable performance, the system is emerging as a transformative solution for survey operations. The Maritime Broadband Radio is a smart antenna designed for use in any application where digital high-speed reliable communication and data transfer is crucial for efficient and safe operation. MBR antennas have software controlled dynamic pointing direction for optimal link path, so with a good antenna location there is no limitation in manoeuvring or vessel speed. Loss of connection during turning, rolling and pitching is a real challenge for vessel communications during surveys, but the MBR has far more resilience and can maintain a connection during very tight manoeuvres and even when obstacles arises during an operation. MBR can allow more data to be sent to units in the network, so that experts can act on it during, rather than after a survey. This means it will be possible to amend a vessel’s survey path quickly, enabling focus on interesting areas almost immediately, or to repeat incomplete or corrupted lines. With the current workflow, these areas may not be discovered until the vessel comes home, so further investigations would require another full and expensive mobilisation. With access to quality data there is potential even to re-think the very foundations of how, and where hydrographers work. Today’s survey vessels are mostly self-contained, but if high-quality survey data can be transferred and monitored faster, more reliably and for less cost than using satcom, it is possible to place more experts in central operations centres, either on board a mothership or on land. From here, these experts could control and service multiple vessels and assets. 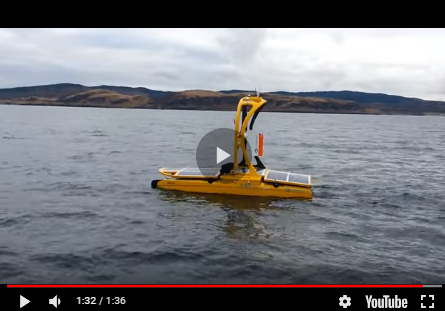 This approach can enable applications for Autonomous Underwater Vehicles (AUV), Unmanned Surface Vessels (USV), smaller survey launches and even Unmanned Aerial Vehicles (UAV), using a single mothership as a base and/or with a central control centre. Establishing such an operation with tangible benefits can only happen if the mobile assets can communicate and deliver full-quality survey data using IP connectivity. Data transfer between vessels and assets via the MBR network. This multi-asset approach has already been tested using the MBR. In an exercise called Autonomous Network of Heterogeneous Vehicles (ANOHV), four autonomous units – UAV (Unmanned Aerial Vehicle), USV, AUV and a tethered relay balloon – were guided from a mothership in various tasks requiring precise coordination from the command centre, and with each other. MBR provided the one central element without which the operation would not have been possible: communication. The exercise had multiple goals, including demonstrating AUV operations using a multi-vehicle, multi-platform network, but also to demonstrate integrated operations using high-bandwidth communication between all nodes in the network. During the operations, an aerial drone supplied streaming images, the tethered relay balloon, named OceanEye, was elevated from the ASV Telematron, which also shadowed HUGIN, an AUV developed by Kongsberg. The command centre for the exercise was located onboard R/V Gunnerus, the research vessel of the Norwegian University of Science and Technology. The HUGIN AUV collected bathymetric data and identified pre-set targets, even performing a mid-dive redirection on command from the R/V Gunnerus via a relay station, using MBR and an acoustic communication link, demonstrating flexibility that opens new opportunities for use of AUVs. And although the command centre during ANOHV was at sea, the same operations would be possible with MBR, with access to the same data communication speeds if it was ashore and within range. During the operations, an aerial drone supplied streaming images, the tethered relay balloon, named OceanEye, was elevated from the ASV ‘Telematron’. MBR has also been demonstrated in several live survey operations with the Kongsberg EM 2040C multibeam echo sounder and Seapath 330/130 motion/positioning systems installed onboard a survey launch. One of these demonstrations was part of Kongsberg's efforts to introduce new technologies and applications during the CINTECMAR congress which was held at the end of 2016 in Barranquilla, Colombia. Once all the systems had been installed and tested the live demonstrations were started with actual multibeam survey operations up to the mouth of the Rio Magdalena River (about 11 kilometres from the Convention Centre). During the demo, there were live interactions with the crew on board the survey launch and the KONSGBERG staff at the CINTECMAR congress venue. Using MBR, the on-shore team was able to give instructions to the crew on board about certain survey operations based on the multibeam datasets that were being transferred from the craft as soon as they were collected, also via the MBR. Though small in scale compared to the multi-asset potential of MBR, the demo explored the ways in which the system can help the industry to rethink how marine survey operations can be conducted; from remote assistance and live technical support (trouble-shooting, equipment inspection, etc.) to immediate dataset sharing with experts in an operations centre. While allowing for dynamic vessel operations, MBR also provides a way to quickly check that multibeam datasets have been properly collected the first time, allowing any technical issues to be tackled in time so that there will be no need to return to the survey area. The HUGIN AUV collected bathymetric data and identified pre-set targets. Operations so far have been conducted at ranges beyond 50km, depending on antenna height. While this introduces ship to shore communications at quite a distance from the coast so that many operations can benefit immediately, much of the focus now is on communication and control involving seaborne assets vessel to vessel, either manned or unmanned. Considering the size of raw multibeam/sonar datasets, MBR does not provide live streaming to the operations centre, regardless of whether it is on a mothership or on land. However, based on typical dataset sizes, it is usually possible to start the processing of data at the centre within 30 minutes of the survey starting, which is an improvement over waiting for a vessel to return to port and having the hard drives delivered to the office. Additionally, Kongsberg Maritime’s Subsea division has already developed software for its hydro-acoustic systems to ensure they leverage the potential of MBR effectively and efficiently. There is also the issue that the application of unmanned vessels and high-bandwidth communication technology could reduce the global workforce dedicated to surveying. However, the applications for MBR are more about optimisation and re-configuration of current processes and not replacing the human element – the skill of the hydrographer will still be needed, but they may be working from an operations centre controlling multiple assets rather than dedicated to a single ship or launch. Operating large, manned ships is one of the larger cost drivers in complex operations at sea, and using a fleet of smaller vessels with additional autonomous assets can reduce costs and eliminate risks to crew. Essentially, though, it could improve performance, as access to central resources provides an even broader knowledge and experience base for survey operations. MBR is the first system that can truly enable this multi-asset approach and transform survey workflows for more efficiency.